U.S. Geological Survey scientists tinkering around with freshwater blue-green algae from Lake Okeechobee have made a simple, yet potentially significant discovery: the amount of salty water needed to transform the tiny organisms from benign to toxic as they travel toward busy coasts. "Our findings open up the possibility that water managers may eventually be able to help reduce the algal toxins reaching coastal waters by manipulating salinity," said the study's lead author and USGS biologist Barry Rosen. Blue-green algae naturally occur in fresh water, including Lake O, and provide the foundation for the food chain that has made the lake a destination for bass anglers and birders. 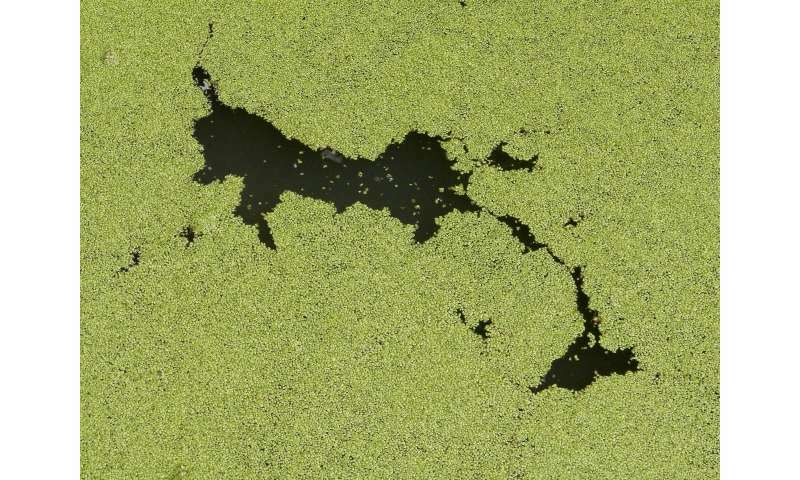 But fed by too many nutrients flowing mostly off farms and ranches to the north, Lake O's algae can explode into dense blooms that block light, smother life and sometimes release toxins that can make people and wildlife sick. Last year, Hurricane Irma and high run-off from agricultural fields to the north helped set the stage for one of the worst blooms in recent history. Gary Goforth, an environmental engineer and former chief engineer for the South Florida Water Management District, has estimated that 2.3 million pounds of phosphorus, one of the nutrients that feeds blooms, flowed into the lake—the highest amount ever recorded. That helped trigger summerlong blooms that at times covered up to 90 percent of the 740-square-mile lake. During a bloom last year, USGS researchers scooped up algae from Eagle Bay on the lake's north side and over four days exposed it to different concentrations of sodium chloride "simulating what it would be like if the organism were moving down through saltier water," Rosen said. As salt increased, they found membranes lining the cell walls of the algae began to break down, releasing toxins. At levels about half as salty as ocean water, the more common of the two algae began releasing toxins. At a quarter the amount, toxins began to leak in the less prevalent algae. Scientists noted too that the amount also spiked at lower levels of salt. "It increased in the short range before it dropped off, so it's possible the cells are slightly more toxic on exposure to milder concentrations of salt," Rosen said. That means if water managers can keep salinity lower in the estuary, the toxic impacts from blooms could be reduced, lessening the threat to humans and wildlife. But "threading the needle—keeping both waters flows and salinity in the right zone—would take a precise timing of water releases. Lake releases now often come in huge pulses designed to safeguard the lake's aging levee but less suited to protect the health of the estuaries. "If you can tell where salinity is that causes death and leaking (toxins) will be," Rosen said, "and if it's not near people, probably that would be good."